A US politician has condemned the "predatory practices" seen in games that feature loot boxes or crates. Games use them to give random rewards and they are acquired either through gameplay or by spending real cash. Hawaiian state representative Chris Lee said games using boxes resembled casinos and called for laws to limit their use. The condemnation comes as Belgian gambling regulators investigate the growing use of in-game rewards. In a statement posted to YouTube, Mr Lee singled out the use of loot boxes in Electronic Arts' Star Wars Battlefront II game. He called the game a "Star Wars-themed online casino designed to lure kids into spending money". EA responded to Mr Lee's criticism via a statement released by the Entertainment Software Association. It said the crates were not gambling and it was a gamer's decision about whether they took advantage of the "optional feature". 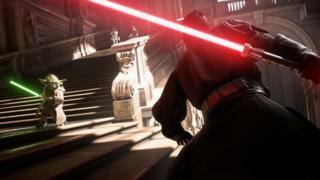 The Battlefront II game has been criticised widely since its release earlier this month because of the way its loot box system worked. The furore led EA to turn off a way for people to pay to get more loot boxes. Many complained it meant gamers with deep pockets would have an advantage because they could buy useful boosts for their character's abilities or get at powerful heroes more quickly. The row has led Belgian's Gaming Commission to start its own investigation. It said because players paid money and received a random reward, the games could fall under its jurisdiction. US authorities recently decided that games using loot crates do not constitute gambling because players do get some kind of reward when they acquire the boxes. In the UK, the Gambling Commission took a similar stance and said the boxes did not come under its control because rewards were usable only in the game. Ed Barton, an entertainment analyst at consultancy Ovum, said loot box mechanics were becoming an increasing part of games for which people had paid a full price. Some games, such as Blizzard's Overwatch, he said, gave out only "cosmetic" boosts that did not affect how the game was played. But, he added, there were others that sought to totally monetise a game via loot boxes. "There are a number of people who are uncomfortable that this mechanism is being put into games," said Mr Barton. Their unease stemmed from the psychological tricks gamemakers used to drive interest in getting and opening loot boxes. The same tricks were used in gaming machines and casinos to keep people playing and paying, he said. "Loot box opening, the sirens, the noises, the way it slowly opens - it's all designed to stimulate your senses. "It's like pulling the handle on a one-armed bandit - you don't know whether you will win," said Mr Barton. "The impact this has on your brain is pretty well established." Marc Etches, head of the Gamble Aware charity, said it was increasingly worried about in-game reward systems. "It is becoming more and more difficult to distinguish between some increasingly common features in computer games and gambling," he told the BBC, adding that there was a danger that loot boxes were "normalising" gambling for many young people. "Current legislation was not designed for this technology and loopholes need to be closed urgently," he said.